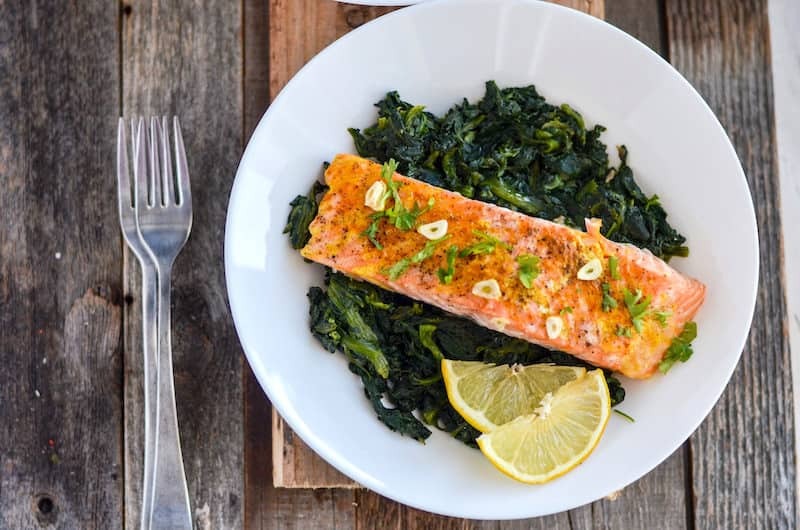 If you’re looking for delicious and easy adrenal fatigue recipes, this baked salmon with garlic spinach is perfect – and so simple to make! I’ve talked a bit about having adrenal fatigue here on the blog; today I’m excited to share one of my favorite adrenal fatigue recipes! 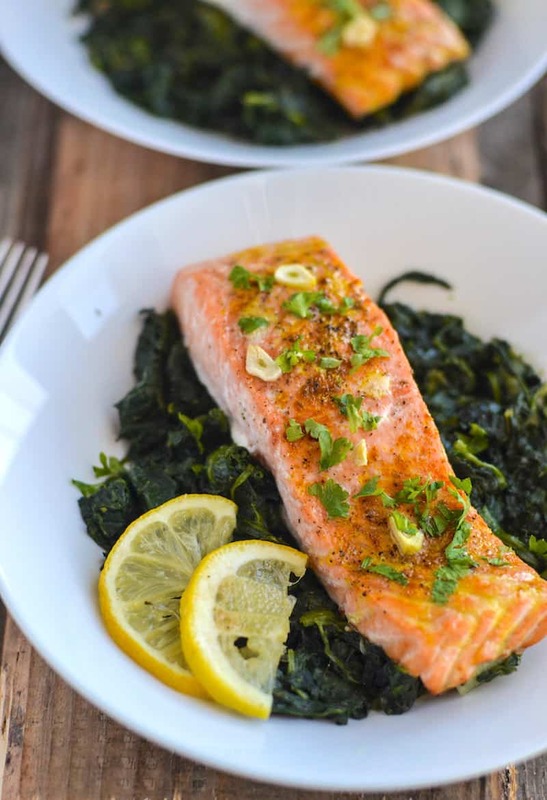 This baked salmon and garlic spinach recipe also falls into the paleo category if you are following that food blueprint as well. 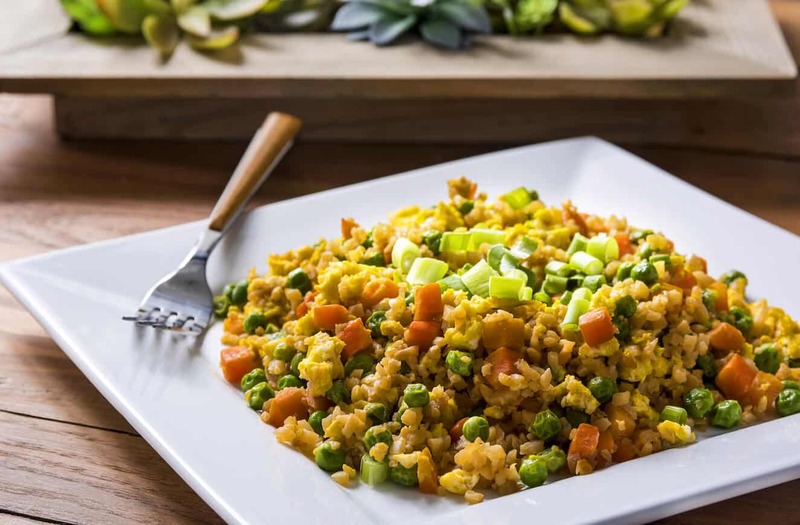 It’s perfect if you are exhausted thinking of delicious recipes that are also good for you – which I often am. 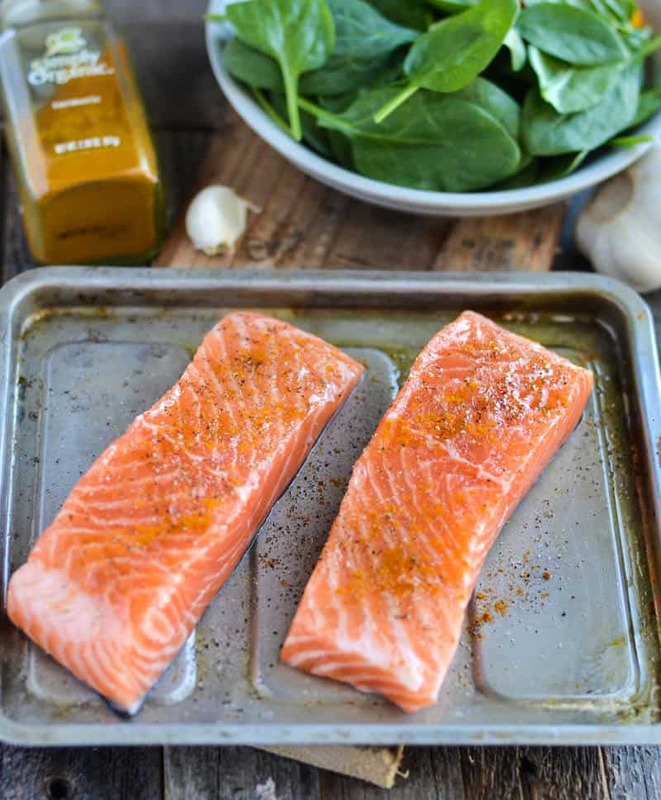 I feel like I need a few fallback recipes for those days I don’t feel like meal planning, and this salmon and spinach falls into that category! The spices you’ll use are what bring out the natural flavors of your raw materials. That’s how I know a recipe is a success . . . when I can throw together basics and I thoroughly enjoy the result. 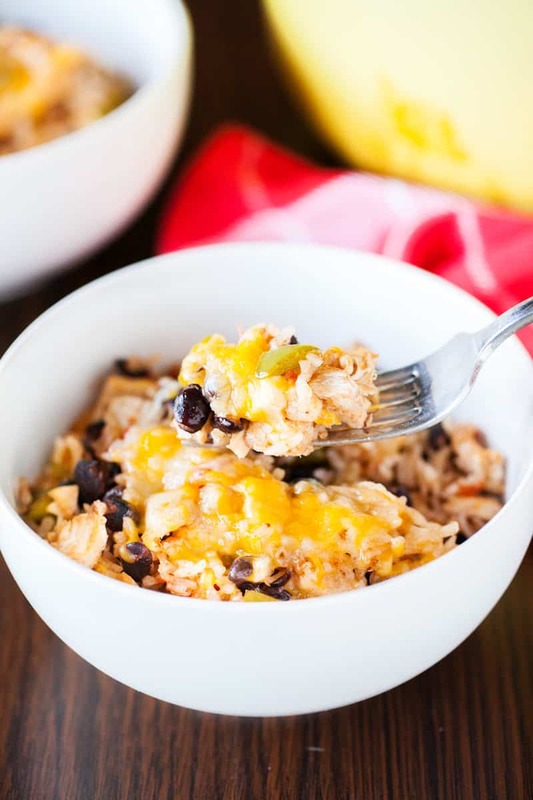 If you’re looking for healthy paleo or adrenal fatigue recipes – this one qualifies. Preheat oven to 400ºF. Line a baking dish with foil or parchment paper or lightly grease with coconut oil and keep aside. Marinade the salmon with salt and freshly cracked pepper, lemon juice, 1 tsp of melted coconut oil, turmeric, and garlic powder. Arrange a few slices of garlic on the salmon filets (optional). Let it sit while the oven preheats. Once the oven preheats, bake the salmon for about 15 minutes or until it starts flaking. While the salmon is baking, heat the coconut oil in a pan and fry the garlic for about 30 seconds to 1 minute. Add the spinach and cook until the spinach wilts. If you are using frozen spinach, there will be extra liquid. Cook till the water evaporates or pour off. Season with freshly cracked black pepper and salt. 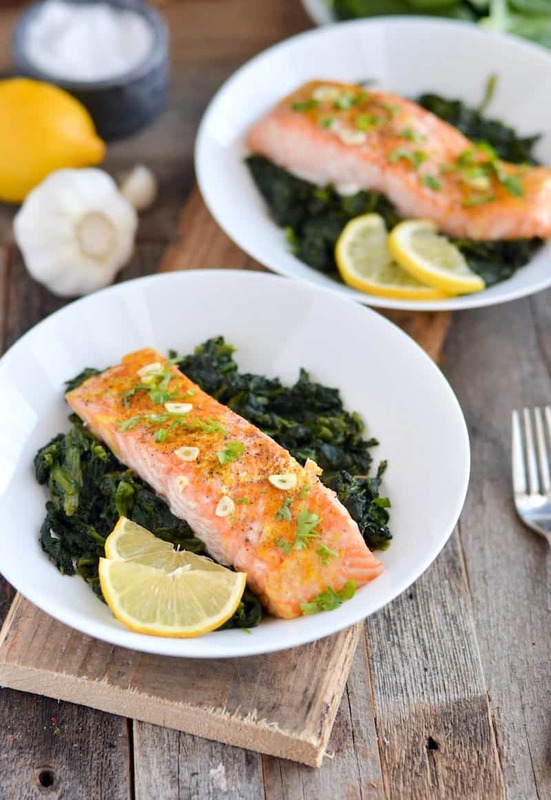 Serve the baked salmon on a bed of cooked garlicky spinach. 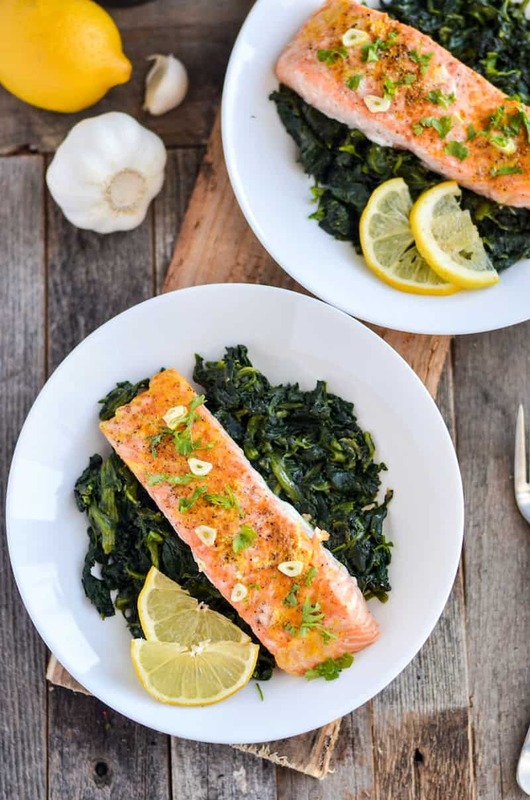 If you're looking for delicious and easy adrenal fatigue recipes, this baked salmon with garlic spinach is perfect - and so simple to make! Once the oven preheats, bake the salmon in the oven for about 15 minutes or until it starts flaking. While the salmon is baking, heat the coconut oil in a pan and fry the garlic for about 30 seconds to 1 minute. Add the spinach and cook until the spinach wilts. If you are using frozen spinach, there will be extra liquid. Cook till the water evaporates or pour off. Season with freshly cracked black pepper and salt. 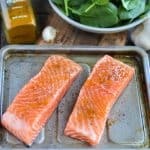 Not only is this baked salmon paleo and Whole 30 friendly, but it’s Weight Watchers Freestyle friendly too! If you use fresh salmon that is skinless, you’ll have a meal that is only 3 points per serving IF you use the coconut oil. 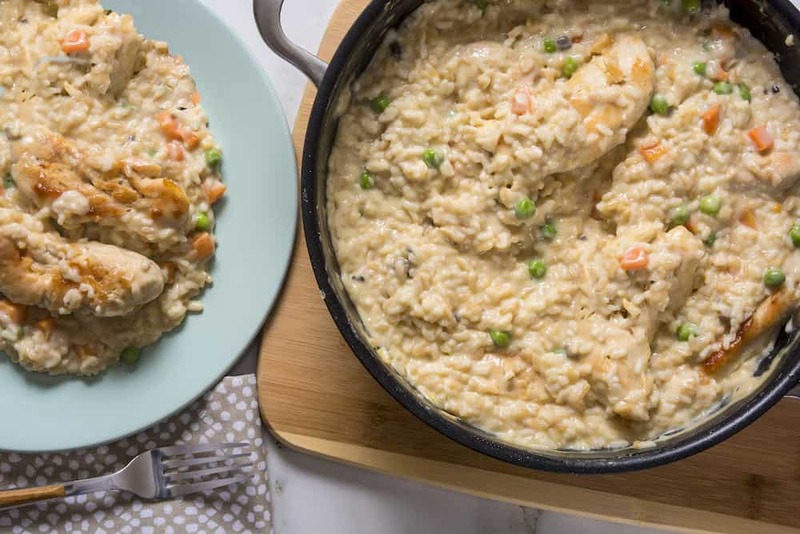 If you choose to forgo the coconut oil, the entire dish is ZERO points per serving. 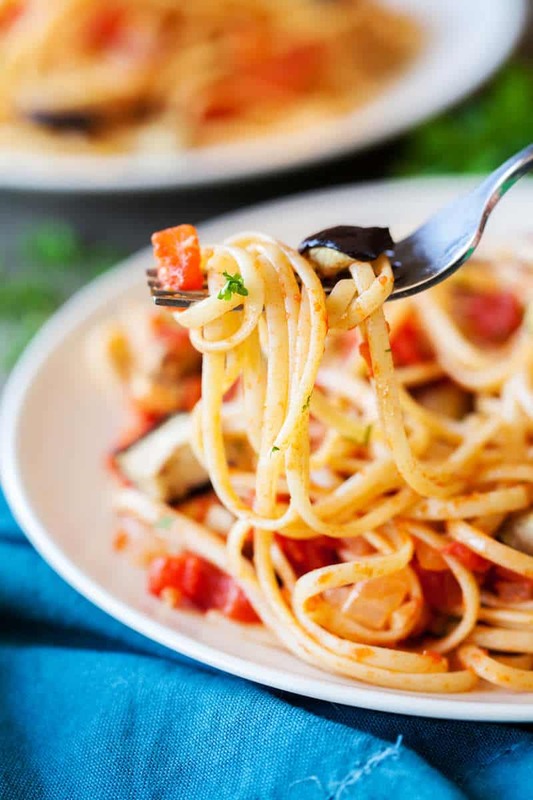 I’ll give you even one more choice – use olive oil for a total of 2 points per serving. It’s really up to you. 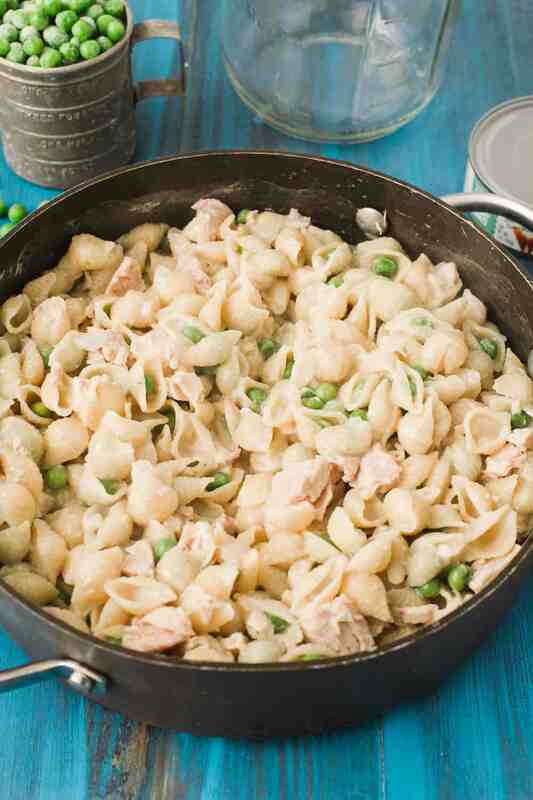 If you try this dish, I’d love to hear in the comments!